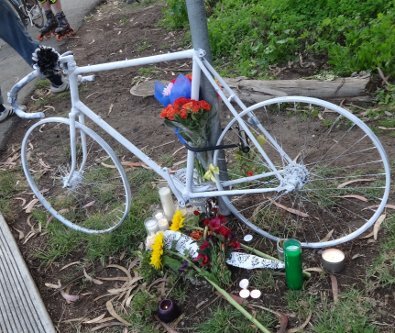 Every now and then I hear about somebody else on a bicycle that got killed in traffic. Usually it's someone else I didn't know at all. Not daily or weekly, but probably more than monthly. This event was different. 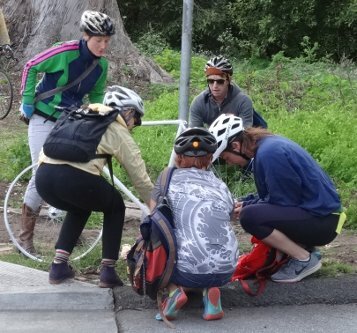 Late the previous week two women had died in different accidents in different parts of San Francisco. It was way more than usual. 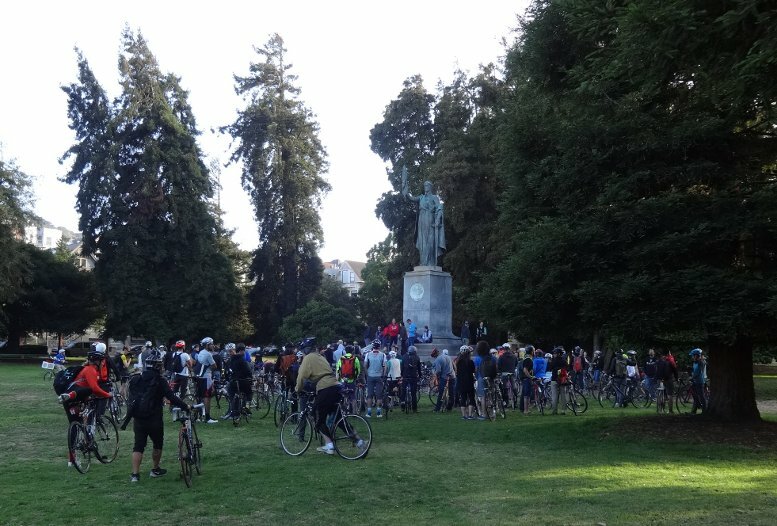 Somebody organized a memorial ride. They asked all of the activists from all over the area to join in, partly to make a "we are in this together" kind of statement. I decided to go. 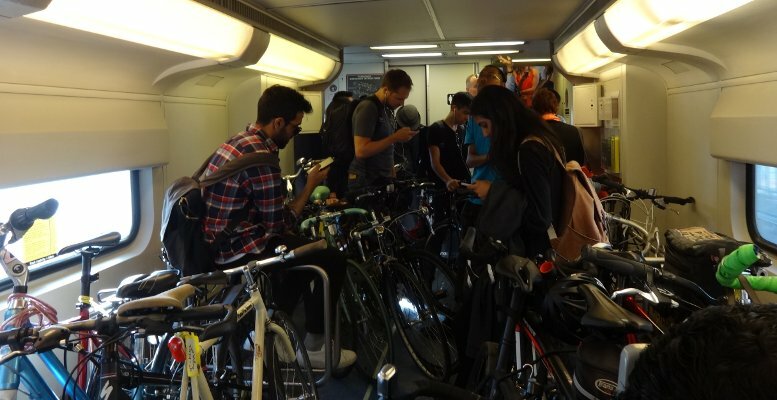 Most of these people are just normal traffic on the train. 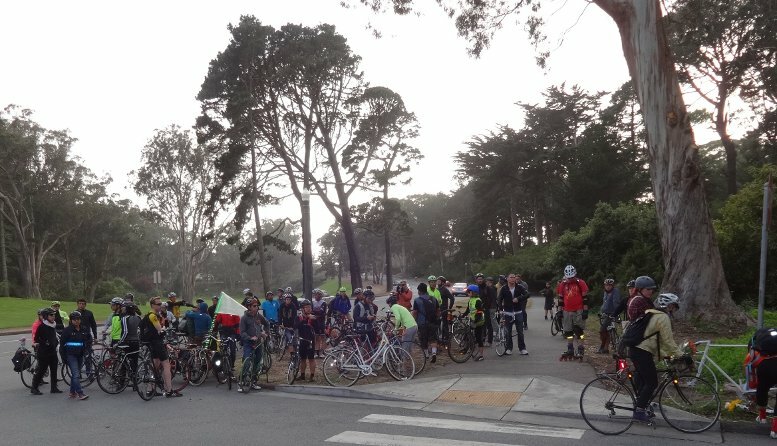 Only Frederick (teal shirt) and I (green handlebars on the right) were there to be part of the memorial ride. Didn't know Frederick was coming, just saw him on the train. 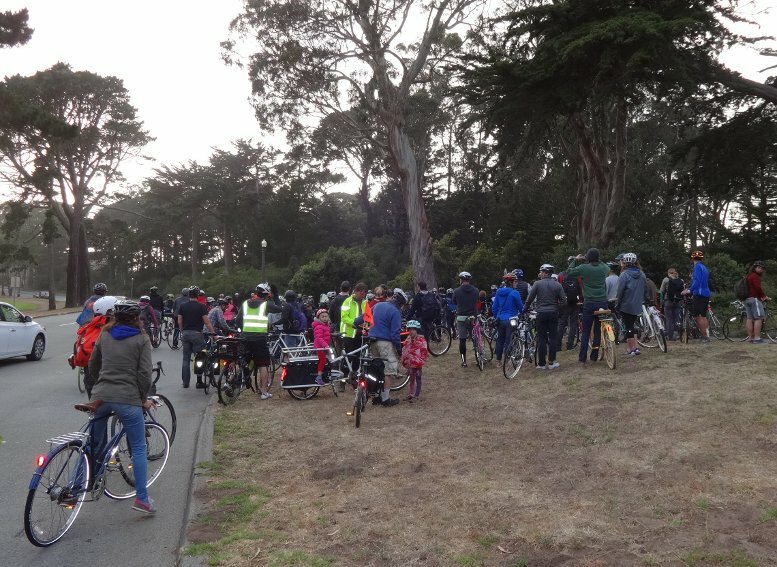 It was full enough that there really wasn't room for more bikes. I've no idea how many were bumped because there wasn't room, but there must have been some. 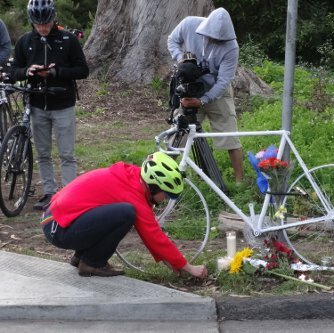 This was much more than just the family and friends of two bicyclists. 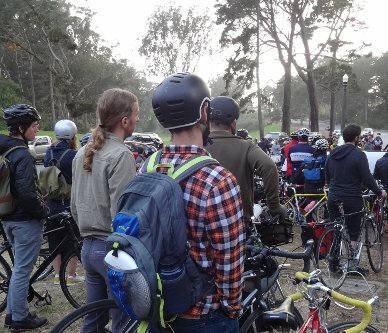 I saw lots of friends among the riders, and many new faces. 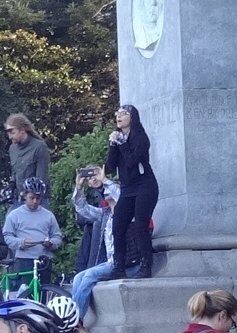 After a while this woman spoke up. 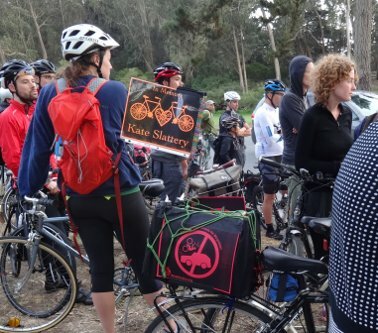 She explained that we would first ride out to 30th where Heather was killed by a zooming car. 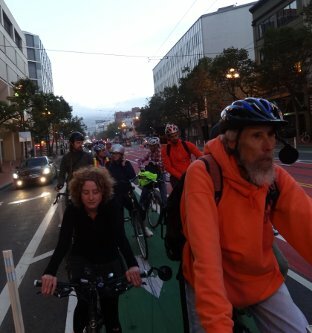 Then we would ride down to 7th & Howard where Kate was killed by a driver illegally running a red light. 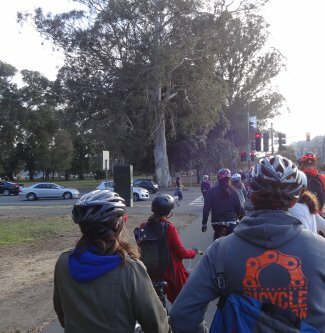 She wanted all of us to ride courteously and obey the law. She also asked us to be quiet and respectful and follow the bike with the big green flag. It wasn't long after that before we were moving. By this time people were mostly quiet. 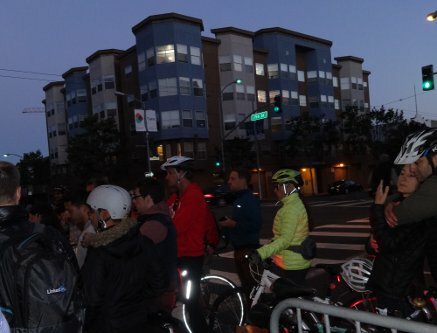 I moved forward along the side of the crowd to see where the ghost bike was. It was across the street, along with many more of our number. 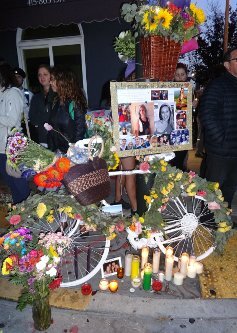 One by one and in small groups people that cared about the deceased would go up to the ghost bike. Some would pray. 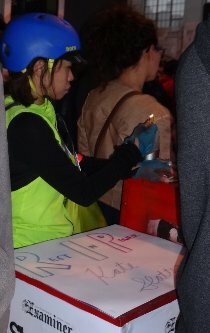 Some left a candle or flowers or incense or something else. Most just watched quietly. After a while this guy went around with these fliers. 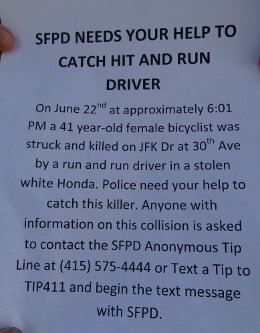 If you have any information, please call the number and share it with the SFPD. It took a while, but soon enough we were rolling again. 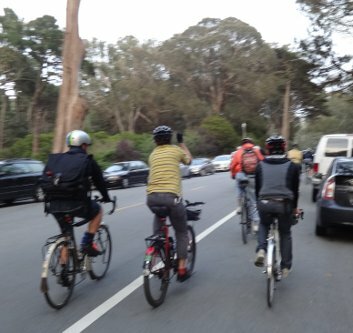 I remember riding behind a guy that was telling someone else about how those dot com zillionaires like to zoom around the park in their incredibly fast cars. The tone was something like "this accident would have happened sooner or later. I wish those guys would get a clue." 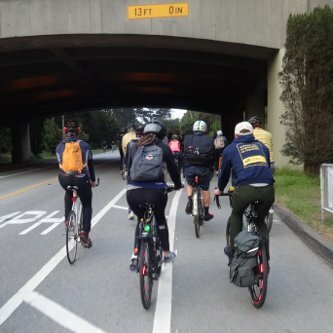 It was a remarkably polite group of riders. 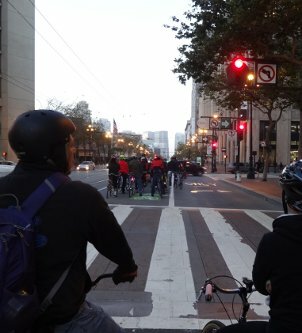 We stopped for every red light. 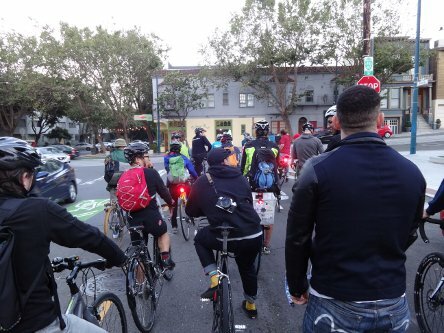 We even broke into groups to go through stop signs without making cars wait too much. 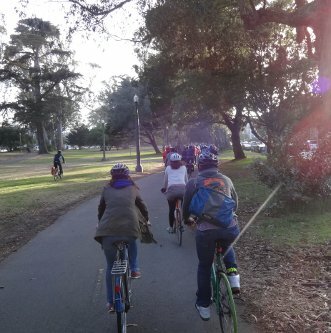 After half an hour or so of pedaling we reached the other site. 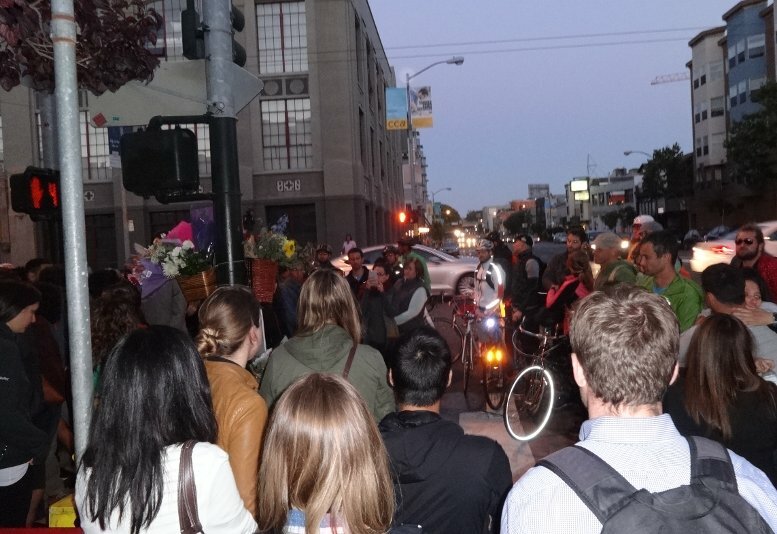 At this one the family and friends of Kate were already there, a couple of dozen people on the sidewalk around the ghost bike. We joined the throng quietly. 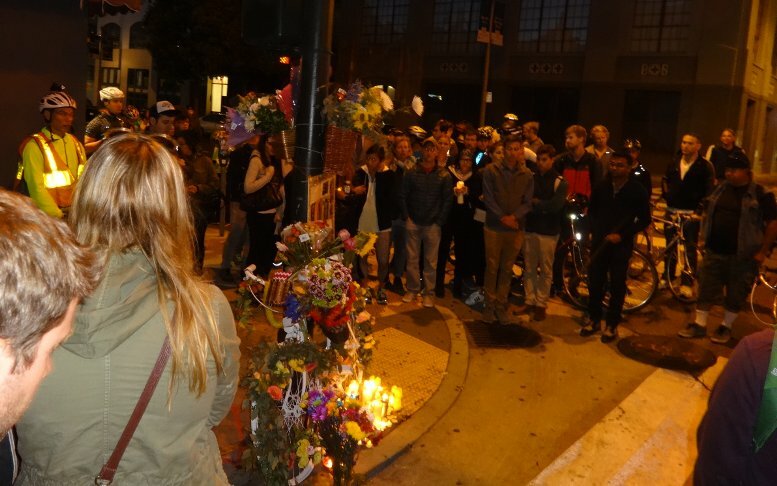 Again, people were taking turns paying respects, but there were many that were teary eyed. Somehow it was catching. I found tears welling up in my own eyes. 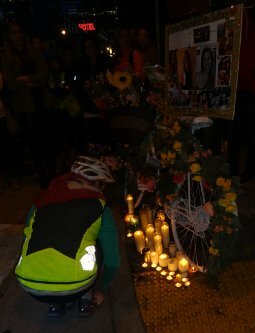 So sad for such a beautiful young woman to be done in by a car while commuting on her bicycle. Please be careful out there. Too many of us have died already.